Saving civilization – are you a Roman or a saint? 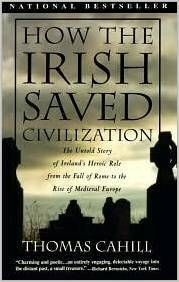 Thomas Cahill’s marvelously humane history How the Irish Saved Civilization tells how a handful of inspired monks isolated at the far edge of a crumbling empire first preserved and then replanted the most precious seeds of ancient civilization – the ideas and knowledge contained in its greatest Hebrew, Greek, Roman and early Christian books. I know I’m too much a Roman, too little a saint. Still it’s been my privilege to work with a few saints among my colleagues and clients during a career in philanthropy. Cahill reminds us that their dissent from selfishness is not eccentric or futile but essential to our fate. Thank you.